The desired shape, size, composition and surface structure of nanoparticles can be achieved in a single step. The Syringe Pump controls the syringe temperatures, pumping volumes, and pumping rates according to user-specified settings. The Reactor Heater delivers a uniform distribution of heat of up to 300°C in the supplied 250ml vessel. Heated Lines, connecting the Syringe Pump to a reactor or other downstream unit maintain even temperatures which can be controlled via the pump or PC Software. Samples can be collected in 10 vials. 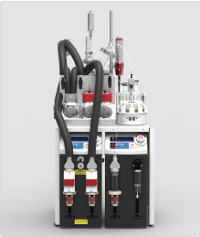 Full process automation: Reproducible, sophisticated quantum dot synthesis. Rapid Reaction Vessel heating: The heater block surrounding the reaction vessel ensures uniform heat distribution and rapid heating of the reaction vessel (to +300°C). Intelligent temperature control: The Syringe Pumps enable independent heating and maintaining of temperatures in 2 syringes and in the Heated Lines. Easy control of process parameters: Precursor temperatures, dosing parameters, reaction temperatures and times, sampling volumes and intervals, reactor cooling times can be set from PC Software. Flexible dosing: 3 syringes can dose 25ml each with volumes from 0.1ml to 5ml. Allows high-temperature dosing of up to +120°C. Automated sample collection: 1 sampling syringe for controlled collection of 7.5ml volume samples in 9 collection and 1 waste vials. Long continuous operation times: Up to 72 hours. Easy monitoring of reactions: Reaction monitoring using a temperature and turbidity probe (optional upgrades include absorption (ABS)/fluorescence (FL) spectrophotometers). Narrow particle size distribution: Excellent mixing and temperature control leads to improved homogeneity of particle size. 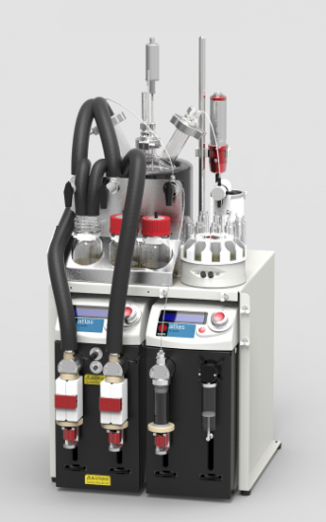 Rapid nanoparticle optimization: Process conditions such as temperature, time, mixing, reagent ratios and concentrations can be quickly varied. Easy integration: The system is compatible with some spectrometer equipment for real-time and recorded spectral data. Safe: Heater Line and Heater Block are insulated ensuring safe operating environment. Precursor temperatures, dosing volumes, dosing intervals, dosing rates (i.e., time of precursor addition as determined by the combination of total added volume and flow rate), number of dosing steps, reaction temperatures, reaction times, sampling volumes, sampling intervals, reactor cooling times can be set using the PC Software. +300°C to 80°C in 90 minutes . 25 ml each (SGE), can be replaced during an experiment. 0.1 – 5.0 ml (+/- 0.01 ml or +/-2%, whichever is greater). 2 syringes ambient to +120°C (± 5°C), 2 syringes at ambient. 9 collection vials and 1 waste vial. 7.5 ml (± 0.1 ml). 0.5ml, 1ml, 2.5ml, 5ml, 10ml, 25ml or 50ml. 3, 4, 6 or 8.